Wondering what plays to call in your snack huddle? Here are 10 crowd-pleasing options for your snack playbook that will have your favorite fans dancing in their end zones. Kick things off with drinks—like our Hail Mary cocktails or one of our top draft picks. Hand off crispy Parmesan potato chip quarterback sacks to every guest. Later, move down the field with some personal fowls buffalo chicken kabobs and pick 6 dip, with a side of crunchy celery long snappers. For those still on the fence, or rather, sidelines, get them into the game with crispy bacon jam turnovers or some li’l pigskins. For more substance, serve up long bombs, our BBQ-slathered pulled pork subs. Then score the final game-winning points with some sweet and crunchy blitz bars. And don’t forget, in addition to these delicious recipes, we have free printables you can use so guests can share in all the pun fun at the buffet table. Plus, add to the atmosphere with our easy-to-make football crafts. Chicken breasts are marinated in hot sauce, lime juice and spices, then grilled on skewers to create a finger-friendly appetizer option at your next game-day gathering. Score style points and flag these tasty buffalo chicken kabobs with our fun personal fowls printables and serve with our pick 6 dip. Made with just 6 simple ingredients, this cool and creamy blue cheese dip pairs perfectly with our spicy buffalo chicken kabobs or fresh veggies. Go for the win with our pick 6 dip printables and long snappers celery printables. Is bacon your jam? Then you’ll love these savory pastries stuffed with our sweet and smoky bacon-based relish. Topped with our turnovers printables, this easy appetizer is sure become your new game-day grub MVP. Bratwurst is simmered in beer, cut into bite-sized pieces, wrapped in bacon, and then glazed with a sweet and spicy sauce. 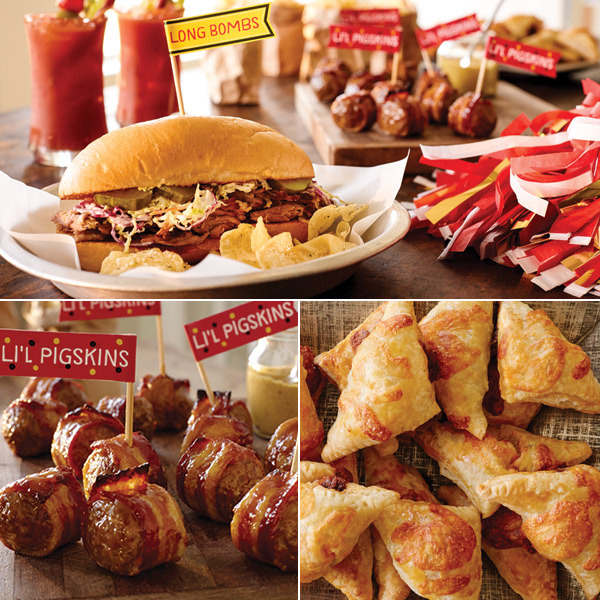 Go for extra points with our li’l pigskins printables to flag these addictive bacon-wrapped brat bites on the buffet table. Guests can pick their beer of choice from the top draft picks selection you’ve provided for a thirst “ice down.” Give them a range of beers from dark to pale to choose from—and don’t forget to include root beer for the kids. This spicy twist on the classic Bloody Mary recipe will add some pep to your game day. Spike our Hail Mary printable flags with bacon, peppers and olives for an all-star garnish lineup. Make these delicious warm potato chips quicker than your team can make a first down! Hut one: Spread a bag of kettle chips on a baking sheet. Hut two: Sprinkle lightly with freshly grated Parmesan cheese and herbs of your choice. Hut three: Warm in a 200ºF oven for 10 minutes or until cheese melts. Hike: Divide into paper lunch sacks and serve with our quarterback sack printables. Go long on flavor with this easy pulled-pork recipe made in the crock pot. Pork shoulder gets a rub of sweet and smoky spices and then slow cooks to fork-tender perfection. Pickles, jalapenos and coleslaw top off these amazing barbecue pulled-pork sandwiches that are sure to be a real crowd-pleaser at your next game-day get-together. Just make sure to provide guests with enough protection around the pocket—napkins!—and serve with our long bomb printables. These sweet and salty Blitz Bars are so good, you won’t know what hit you. A salted pretzel crust is topped with a mixture of melted bittersweet chocolate, peanut butter, almonds, dried cherries and coconut to create a decadent dessert. Top with our printable blitz bars flags and watch your party guests rush to get their hands on these simply irresistible bar cookies.